While Vietnam recorded the fastest growth in international tourists among Southeast Asian countries in 2017, its 12.9 million foreign visitors was still far behind Thailand (with 35.3 million) and Malaysia (with 26.7 million). Still, if you’ve ever found yourself strolling along the narrow streets of Hoi An’s Ancient Town elbow to elbow with other tourists, or in a line of cruise ships striking out for Halong Bay at exactly the same time on exactly the same itinerary, traveling in Vietnam can sometimes feel very crowded. While we’d all love to have world-famous sites all to ourselves, it usually isn’t possible. 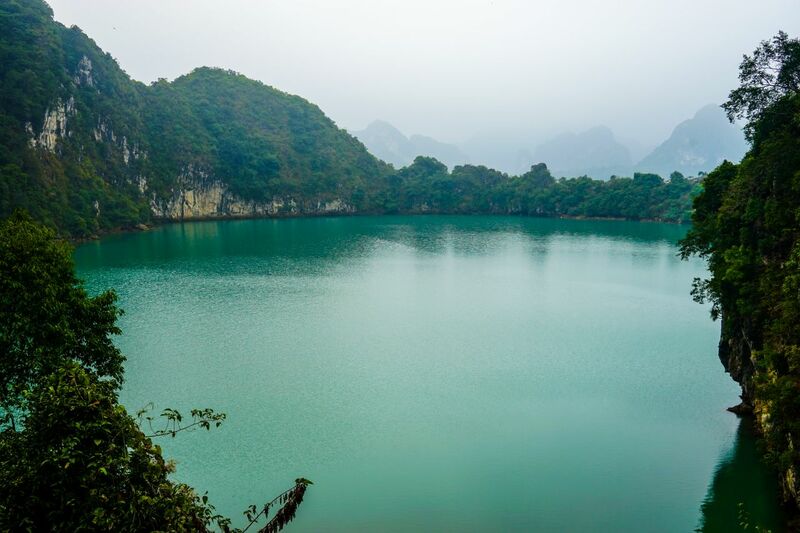 But with these three tips, you can still enjoy unique experiences in Vietnam away from the tourist crowds. Travel Tip #1: Travel low and slow. Sometimes, staying an extra day can make all the difference. This is especially true in places where most visitors follow a prescribed itinerary. Examples include Hue, where visitors tend to go to the Citadel in the morning and the royal tombs in the afternoon, or in Halong Bay, where most people go on a one-night cruise which stops at all the same spots (in part due to government-prescribed routes and the distance a cruise ship can cover in a day). This has the effect of creating a bottleneck where everyone seems lockstepped on the same itinerary from one tourist spot to the next. However, adding an extra day to your schedule may make all the difference in the world. Instead of tiring yourself out trying to keep up with the crowds, that extra time may mean being able to visit Hue’s Imperial Citadel in the evening when the temperatures are cooler and when the larger groups are at dinner or have turned in for the day. An extra day in Halong Bay means being able to explore the islands further out or even nearby Lan Ha Bay where you can have caves and islands literally all to yourself. Travel Tip #2: Go local for the day. There’s a reason why the top-rated tourist spots are popular. There may be something inherently “can’t-miss” about them, like seeing the Mona Lisa in the Louvre or visiting Buckingham Palace when in London. However, there’s something to be said for veering off the well-trodden tourist trail and exploring some of the lesser-known sites. For that, you’ll need to do some research to find the best up-and-coming places, perhaps by following people in the know on social media (for instance Instagram accounts of travel or guidebook writers or street photographers) or going right to the source and befriending a local who’s open to making new connections. There are lots of ways to do this, from asking your hotel’s concierge where he or she brings friends to eat (instead of where hotel guests tend to go), hiring a local guide for the day, reaching out to a Couchsurfing host, or being open to serendipitous meetings, like with university students in the park looking to practice their English. Your local friend will likely be able to show you a different side of your destination, recommending places too new to be in guidebooks or deemed too “local” to be on tourist maps. However, you’ll likely walk away with new insights into local culture, food and lifestyle if you’re open to getting off the beaten path. And who knows, you may even discover a hidden gem yourself! Travel Tip #3: Look for new experiences in a well-travelled destination. Some destinations are iconic for a reason and are impossible to leave off a complete Vietnam itinerary, even if it means having to rub elbows with other tourists. However, with a little bit of research, you’ll likely be able to uncover unique experiences to go along with the must-do ones. For instance, while most cruisers to Halong Bay will leave Hanoi in the morning and arrive in Halong just before noon, why not take advantage of the short window of time before embarking on your cruise to do something totally different, like take a scenic seaplane flight over the islands? While your fellow cruisers kill time in a waiting lounge waiting to board, head straight to the Hai Au Aviation office and hop aboard a 25-minute flight to see the bay from a completely new perspective. Best of all, the small aircraft are limited to just 12 passengers, ensuring an “exclusive” experience. After getting amazing shots and enjoying the thrill of a water landing and take-off, you’ll be shuttled back to your cruise ship’s lounge just in time to board with everyone else. Or in Hoi An, after a morning of seeing the sights of the Ancient Town, why not check out the beautiful countryside in a vintage sidecar? Literally minutes from the bustle of town, you can find yourself in the middle of green rice paddies with only curious water buffalo for company. And being a passenger in the sidecar means you’ll have a great perspective from which to take photos! While Hoi An’s Ancient Town is bordered by the Thu Bon River, just 15 minutes away is beautiful Cua Dai Beach. Why not break up your day and “do” instead of “see” by sailing around in a catamaran? Not only will you pick up a new skill, your memories of Hoi An will include more than just crowds and shopping. Vietnam’s Mekong Delta is also packed with great excursions where you can get away from the crowds. While some destinations can feel like a refueling stop (arriving in the evening only to get up and leave in the morning) or a tourist trap (canoeing down a palm-lined canal is great, but not if there are 20 other boats doing the same thing), with a bit of planning, you can literally get off the beaten path and do something truly unique. Take the border town of Chau Doc, for instance. While most visitors only stop for the evening on a blitz trip between Phnom Penh, Cambodia and Ho Chi Minh City, Vietnam, the area around Chau Doc has so much to discover. The town itself a melting pot of cultures, where Vietnamese, Cham, Khmer and Chinese communities harmoniously co-exist, evidenced by colorful temples and pagodas with distinctly different architectural elements. In addition, there are great day trips from Chau Doc, including the 850-hectare Tra Su Forest just 30 km from town. Spend the day gently gliding over a carpet of water plants in this enchanted submerged forest, home to 70 species of birds. Cross precarious monkey bridges and hike up a watchtower for incredible panoramic views of the forest canopy, sights you’d surely miss if you stuck to the “regular” itinerary. With some research and planning and building extra days into your itinerary, you can see a side of Vietnam that most visitors never get to experience. Or if you’d rather leave the details to travel specialists, Victoria Voyages is all about small group travel focusing on authentic connections to the people and places of Vietnam and Laos. Our itineraries are anything but ordinary, incorporating unique experiences like scenic seaplane flights, private cruises in the Mekong Delta, and vintage sidecar excursions into the Hoi An countryside, just to name a few. See more, do more with Victoria Voyages on your next trip to beautiful Vietnam! Traveling Vietnam: Private Tour, Join-in Tour or DIY?